Let me start off by saying that I'm not a hoarder. I swear. I do, however, like to take a little something home with me to remember each trip by. This started back in college when my friend Jeff (sorry Jeff, definitely throwing you under the bus here) gave me a magnet from his trip to the Philippines. While I appreciated the thought, it was sort of the ugliest magnet I had ever seen: a tiny straw tote bag with plastic sea shells on it. A few months later my friend Ang (again, sorry Ang!) gave me another ugly magnet from her trip to Ireland. Since this was me in college, I forgive you both. When I finally got around to traveling myself, I decided to build on the tiny magnet collection as a way to keep my fridge as tickety tack as possible (and remember each trip, obv). It's also become a fun travel game with my friends: "Help Jen Find the Ugliest Magnet in the City." It's like a scavenger hunt only less boring. My fridge felt very naked without its magnets during this photo. See if you can spot the magnet Staci got me from Detroit -- an ugly magnet for an ugly city. Sadly, I don't have a magnet from every single place I've traveled because I refuse to settle, dammit! (read: I forgot until I was on the plane ride home) Even though this collection is mainly to remember my own travels, I do accept magnets from other people's adventures. So if you're looking for a way to repay me for providing you top-notch procrastination material via this blog, now you know how. Another way I remember my travels is through jewelry. Actually, I found its a cool way to take home a piece of the culture. Some of the pieces that I find are super old -- at least I was convinced they were by the various merchants at the bazaars and souks, and that's good enough for me. I'm not trying to Antique Roadshow these things. I also try to find jewelry that was crafted using local stones and metals so that I'm literally taking home a piece of the place. I know some people achieve this by collecting dirt samples, but I don't wear dirt, k? Pro tip: Jewelry from around the world also makes for a good gift. Just ask Leslie Epstein. 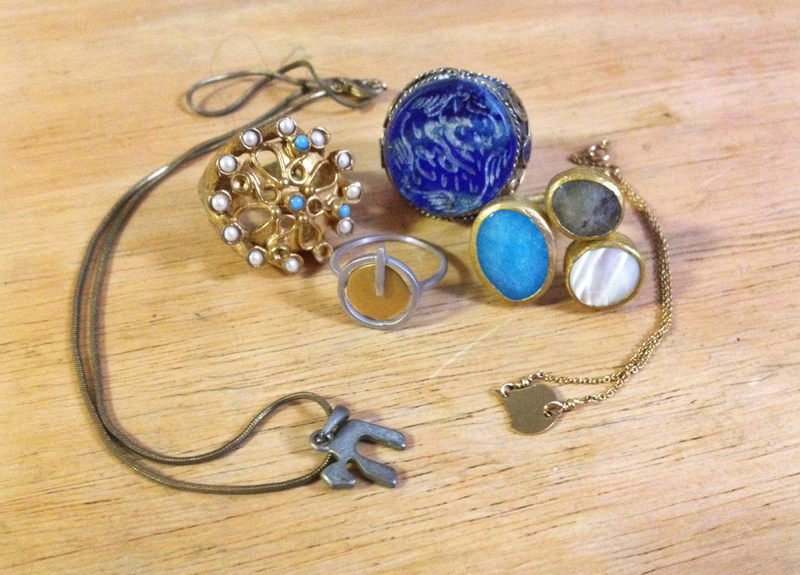 Rings from Spain, Turkey, Dubai, Hungary. Necklace from Israel and bracelet from France. One of my recent collections that I've started is more of a domestic venture. My brother is really into craft beer and started collecting bottle caps from his favorite local brews a few years back. I thought that I could add to his collection by grabbing caps from places that I travel. This is great for three reasons: 1. It gives me the excuse to get drunk on vacay and try awesome local beers, 2. I get to be super awkward and interact with bartenders by asking them for the caps, and 3. It's practically the smallest souvenir ever and easily fits into my purse. I don't always remember to ask for these, so the collection is pretty paltry right now. I guess that's an inherent problem with this one: drinking + remembering does not always work out. Yes, I'm aware that Coke is not an alcoholic beverage, but this came from the Coca-Cola factory in ATL so it counts. I'm excited to see what I bring back from our next adventure (in August)! Any suggestions for where to find cool local jewelry in London, Dublin or Edinburgh? What souvenirs do you collect?